HOME » udon » The noodle will be made tomorrow.! The noodle will be made tomorrow.! My younger brother's family will come to play in my home tomorrow. Therefore, I will make the noodle for them. Are you going to make Udon or Soba? 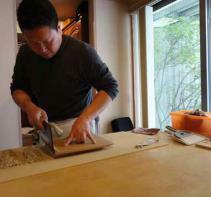 I believe that you will make Soba by the new Kitchen Knife and Cutting board. Whichever you will make, your brother and his family will enjoy it for sure. I made Udon getting up early this morning. bench time was taken for 30 minutes.